Alphacools's fittings go new ways in looks, quality of manufacturing, colours and choice. The inner diameter of these fittings truly deserves the „high flow“ attribute! The first three colours, Chrome, Deep Black and Shiny Copper offer something for every taste. The product matching series are designed to look elegant in every system, highlighting the individual design of the computer. The limits are endless with these Alphacool fittings in combination with Alphacool tubing! With a new process during chromatising the surface finish is completely connected with the brass body, hence ensuring permanent intense colours and peeling of the chrome layer. The Alphacool name in blue lettering on some of the fittings additionally underlines the individuality of these items. 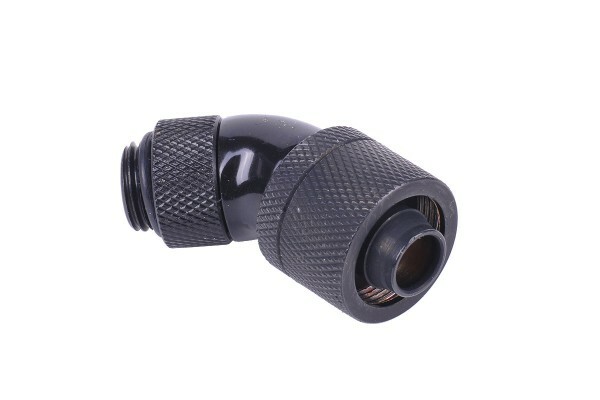 This fitting can be used to connect 16/10mm tubing with a G1/4“ connection thread. The fitting is angled by 45° and is revolvable, allowing easy hose routing in the system.